The 210 is a very well established and quite well known route. The only changes that have been made to it since introduction between Finsbury Park and Golders Green is the extension to Brent Cross and a very minor change in Hornsey Rise. A substantial chunk of the route is its service across the north side of Hampstead Heath, which it has to itself; indeed, until the introduction of route 268 relatively recently, it was the only service to the North End of Hampstead. Famous names such as Jack Straw’s Castle, the Vale of Health, Ken Wood and Rotten Row are all in this area and served by the 210. The route has recently been converted to double deck. It has traditionally been single deck, although double deckers have worked occasionally. A number of reasons for this have been bandied about: most problematic are trees hanging over the road in North End Road. There are also overhanging trees and buildings (!) on the Heath, some of the buildings being so close to the road that passengers upstairs on a double deck bus would be able to see more than the (rather upper class) residents would like, in itself another reason for single deck operation. 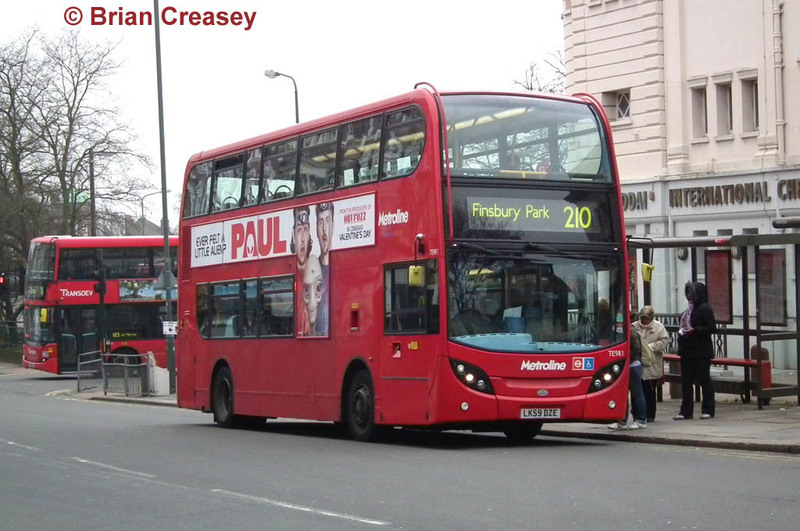 Finally, the route terminates at Finsbury Park where is a notorious low bridge; although the route does not go under the bridge, and indeed double deck routes W3 and W7 also approach it from the north, there have been several accidents here involving buses running out of service. Notwithstanding, heavy loadings together with the availability of spare double deckers following Metroline's loss of the 24, prompted its conversion using early TA class short wheelbase Tridents cascaded from Harrow Weald. 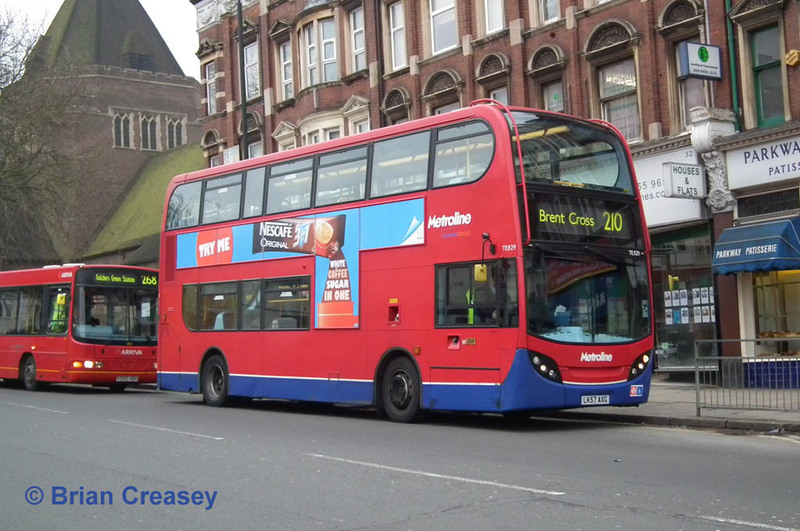 However, such elderly vehicles were not acceptable upon tender renewal in 2010, and the latest Trident/Enviro400 design is now specified, comprising a mixture of new buses and nearly new vehicles drafted in from Brentford garage where they were replaced by new B9TLs. In practice they are mixed in with other batches of Enviro400s on various routes at Cricklewood garage. The newer ones carry all-over red livery, and one of those is TE981 (LK59 DZE) pausing outside Golders Green Bus Station on Monday 21 February 2011. Seen at the same location on the same day but heading the other way is slightly older TE829 (LK57 AXG). This is old enough to pre-date the all-red livery and carries the modified Metroline red and blue livery (the original one had more blue). Neither bus is particularly well patronised, but that probably reflects the time of day. The 210 had a spell with independent operators, having been won by Grey Green from September 1990. Grey Green used some unusual bus bodied Volvo B10M coach chassis from their base in Stamford Hill, and the most direct route between there and the terminus at Finsbury Park is under the low bridge! Grey Green did use the odd double decker before someone noticed that their contract banned this, and this is thought to be how one of the company’s Volvo Citybus double deckers (136, F136 PHM) lost its original roof. However the contract was lost to Thorpes in September 1998, and gained new Dart SLFs in a striking red/yellow "fire" livery. Whilst Thorpes had been running various LT routes since 1992 – viz. the C4, Stationlink, and various mobility routes – the 210 was the company’s first major route, and presaged a considerable expansion prior to the company's sell-out to Metroline. Thorpes' base, in Perivale, was even further from Brent Cross than Grey Green's was from Finsbury Park! Metroline initially kept the route at Perivale, but subsequently transferred it to the rather more local base in Cricklewood.